The Turks and Caicos Flag. Our national flag. We're a proud British Overseas Territory. What is on the Turks and Caicos Flag? 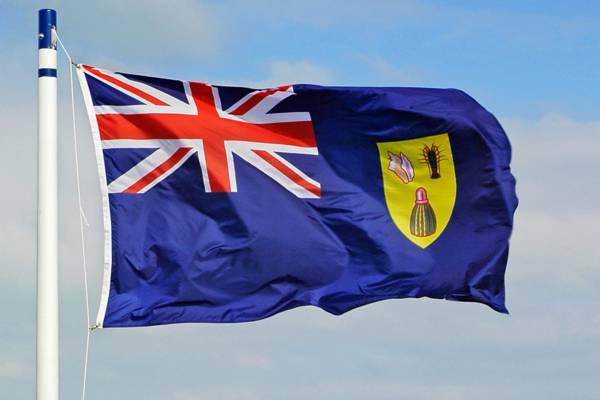 The Turks and Caicos is a British Overseas Territory (along with 14 other countries including Gibraltar, Bermuda, and the Falkland Islands), and accordingly the Union Jack occupies the upper left corner of the flag. The corresponding yellow coat of arms shield on the right of the flag displays a queen conch, the spiny lobster, and the Turks head cacti. The background of the flag is blue, as is the case with many of the British Overseas Territories. The queen conch and spiny lobster have always been very important food sources to those living in the Turks and Caicos, especially before the last few decades. The Turks Head Cacti (Melocactus intortous) is a unique and stubby barrel cacti that’s indigenous to the Turks and Caicos and other islands in the Caribbean. The cactus was likely selected for the flag as it may have been thought that it accounted for the “Turks” in Turks and Caicos. Evidence suggests that our archipelago wasn’t in fact named after the cacti, but rather after pirates. In previous centuries, “Turk” was a synonym for “pirate” due to Islamic corsairs that preyed on the Mediterranean, Africa, and Europe. The Turks and Caicos was once a haven for pirates, and Turks was written on charts by an early map maker to serve as a warning. The name has stuck ever since. The current Turks and Caicos flag was adapted in 1968. The Turks and Caicos Government Crest, used by government departments and agencies, also bears similarity with the flag. The crest features the same conch, lobster and cacti shield as on the flag, in addition to a standing Caribbean flamingo on either side of the shield, a heraldic helmet, and a brown pelican perched on the helmet. Two sisal plants flank the pelican, which are a testament to the sisal fibre industry that existed in the late 1800s and early 1900s. 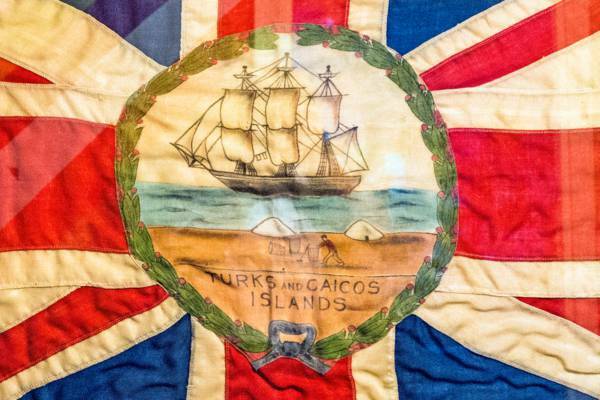 An example of the Turks and Caicos "igloo" flag at the National Museum. One of the best known historical Turks and Caicos flags was the igloo flag. In 1869, the Executive Council in Grand Turk responded to a request by the Home Secretary of the United Kingdom to “sketch of such badge as it may be proposed should be emblazoned on the flag authorised by Her Majesty to be used in the Colony”. A design featuring a ship, a salt raker, and salt piles was created and sent to be transformed into the flag. At the time, the sea salt industry was all-important and the primary source of income to the Turks and Caicos. Unfortunately, giant piles of salt were a foreign concept to the flag maker in London, and he interpreted them as igloos! To complete the abodes, he even added doors! Perhaps the famous tragedy of Captain Sir John Franklin’s expedition to the Arctic in 1845 influenced the mistake, as the sketched design and subsequent flag bears a resemblance to the Arctic. The igloo flag was used for 99 years, until the modern flag was adapted. The governors of the British Overseas Territories also have their own flag, which is a Union Jack with a small central disk containing the shield of the territory they represent.